Got a bug occurring in iPad Mini that is marked as fixed, previous user also reported it occurs on iPad mini. 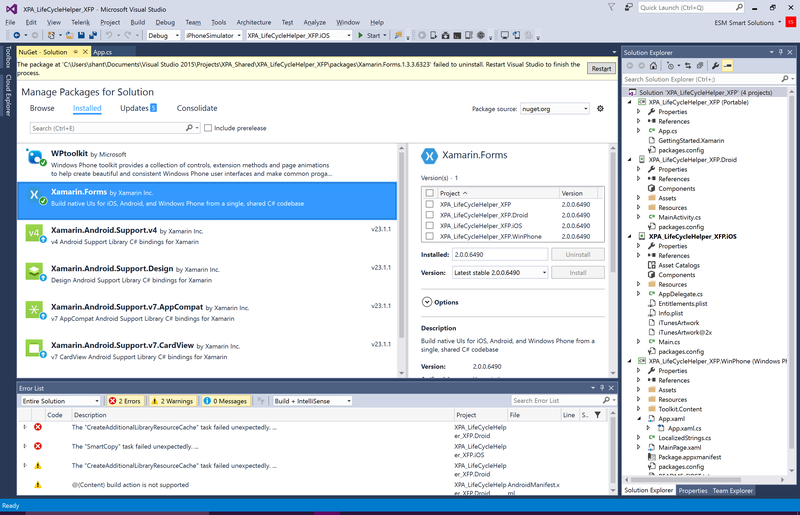 If your application is using the Xamarin.Forms Maps NuGet, you should continue to compile against API 22 until the Xamarin.Forms.Maps NuGet has official support for the latest Google Play services SDK. @ShanePope Thanks for the update. Unfortunately I can't test it because I am using some V23 Resources. I wish Xamarin would mention Xamarin.Forms.Maps when they release Forms, or at least pay attention to it. Instead of one line hidden in a blog post. Imagine if my application was released and the update broke Maps for all Android 6 devices, devastating. I just created a new Xamarin PCL solution in VS2015 and updated Xamarin.Forms to 2.0.0.6490, the latest available on the GitHub. And I get these errors for Android and iOS projects. The pic shows what I have. I did run the fresh created solution before updating XF and it runs in all 3 devices. I have latest Android SDK and have got updated Xamarin libs. What is happening? Every time a new issue with XF!!! Any idea if this is ever going to be fixed?